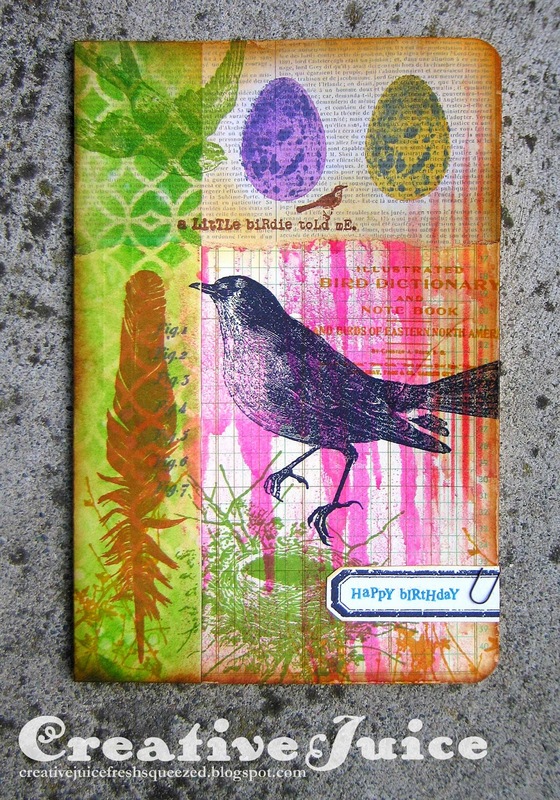 I had some fun with a new Tim Holtz stamp set (Bird Feather) and stencil (Latticework). I also used a bunch of the new Wendy Vecchi archival ink colors. Those new colors are sooo lovely - I want them all now! To start my collage I used Glue 'n Seal to put down a strip cut from an old ledger book. I used a brayer to apply Distress stain to that half of the card, over the ledger paper. Using a brayer gives you a nice streaky look. Over all that, I glued a torn strip of text patterned paper to complete my background grid. I did stamping and stenciling over the top of everything to finish it off. Easy! We would love to see your splash of color project linked up at Inspiration Journal. You can have a chance to win $50 in Emporium Dollars to spend in the store. Head on over and check it out. That is a wonderful spring tag! Well done. Lisa this is exceptional! I love how you used the space and the colors are gorgeous! I simply love this! This card is one of a kind. Really gorgeous color block and composition, wow!